After buying all that cat food at the big chain store recently, my human realized we were out of the food we buy from the local place! So we made a quick trip to the pet store down the street to pick some up. I love going there, but I feel like I got gypped this time. At least there were no dogs, so I got to wander as much as I wanted. 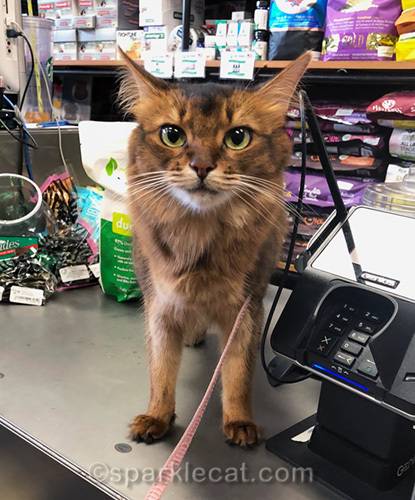 Plus some guy came in to buy cat food, and I got to visit with him. 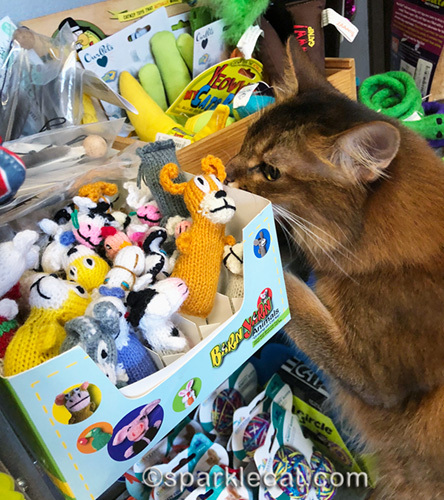 The worker at the store says I just missed the two Sphynx cats that stop by there sometimes. I wonder what would happen if we were all there at the same time? The first area I visited, of course, was the toy section! I always hope that my human will buy me something, but she hardly ever does. Especially since we went to both BlogPaws and the Cat Writers Conference in the past couple of months. She says that even after shipping off so much swag as prizes, there’s still lots of stuff at home. I also tried to interest my human in these Poopy Packs litter bags for cats. They are biodegradable and have a cool pattern on them! But my human didn’t even notice what I was rubbing on until we got home and she looked at the photos. 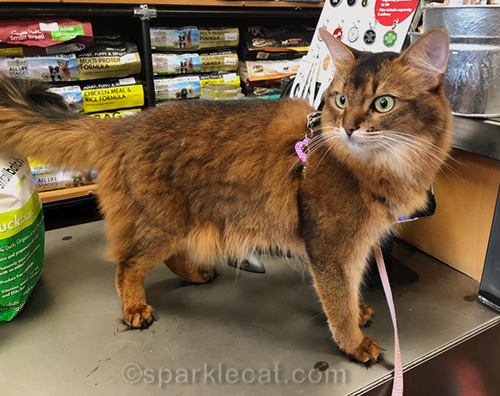 My human picked up the food and I hung out on the counter while she paid — whiffing these awesome Yeowww! catnip toys. No, I didn’t get one of these either — she said I have some at home already. 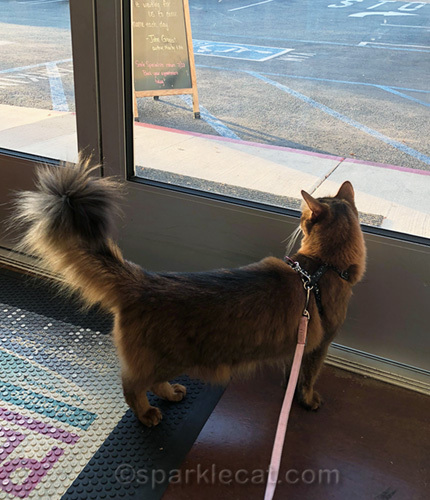 One of these days, I wish I could come to the store myself… without my human, but with her credit card! Minko loved them too and would work at them so hard that he even ripped on open one! MOL! Looks like you had fun even though you didn’t get anything. In one of my dreams, I get to go with you to the pet store and we get to pick out all kinds of stuffs together. We have all kinds of fun looking at the fishes, birdies, snakes, and gerbils! Tummy tickles. It would be pawsome if you got to go shopping by yourself wif the plastic moneys! That was a good visit, Summer. We are sorry your human didn’t get you any toys, though. The nerve! There’s always room for one more toy, right Summer? Summer, sometimes humans are so darned practical! How nice you had the store to yourself, Summer. I have some of those Yeeow toys! But I did not get to go to the pet store…as a matter of fact, I’ve never been anywhere since I came into the townhouse. After all your hard, don’t you deserve some stuff for each visit? How could your human go to the pet store with you and not buy you something?!? Our human does the same thing though, unfortunately. She says we even have unused toys and swag from BlogPaws LAST year! So now we’re wondering… when is she going to bring all that stuff out for us?!? Awww I never am allowed to go in shops. I stay at home and only ever visit the vets, so I think you is real lucky. 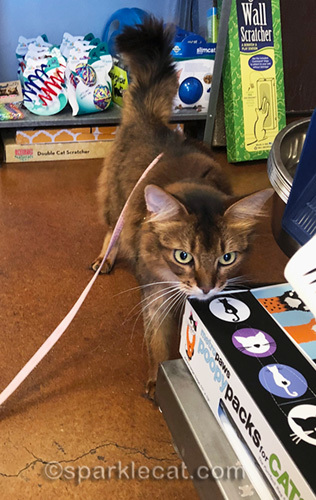 A solo trip with your human’s credit card sounds like fun. Maybe for your birthday? Summer you were on a nip trip for sure. 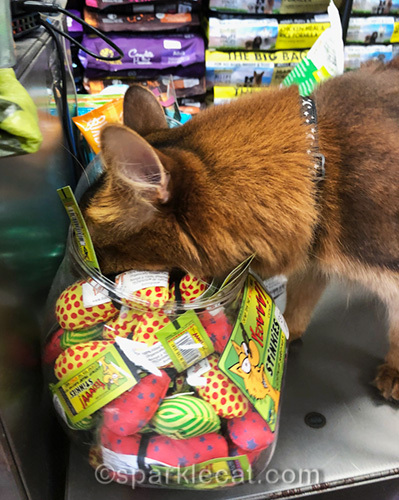 You know if I worked in that store I would be giving out free treats or toys to any 4-legged customers! You should at least go home with a new toy sweet Summer, that seems more than fair! Now that would be fun Summer, to go to the store by yourself with the credit card. The only problem with that would be, how would you get your loot home. Summer, if anyone could wrangle a trip by yourself with credit card, it would be you. And they KNOW you there too. You’re home free! Glad you had fun. Yes, going without your mommy but with her credit card sounds great. Sounds like a fun trip. Going by yourself with the humans credit card sounds like more fun. Looks like a fun trip. Smaller, local stores have a great atmosphere. 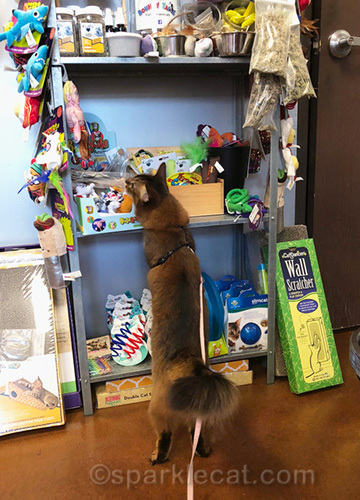 We’d love a go at that toy shelf and bin of nip toys at the counter. It would have been really cool to see the sphinx and our human is intrigued by those bags too. Something for another day.